Government has started working on a new diamond policy which will lead to the unbundling of the Zimbabwe Consolidated Diamond Mining Company (ZCDC) to ensure more players are involved inthe sector, President Emmerson Mnangagwa has said. He said new legislation would be promulgated to ensure that communities with mineral resources benefited by imposing a legal requirement for corporate social responsibility programmes. President Mnangagwa said this on Friday during an interaction with women from across the political and social divide. President Mnangagwa said his administration had realised that communities were not deriving much benefit from resources in their areas hence the need for Government intervention. ". . . the fact that there are diamonds is not a bad omen. I am sure you are aware that under the old administration, we banned seven or so companies, which were mining diamonds and we created one company. We have now realised that one company has no capacity to deal with the exploitation of this mineral, so we are in the process, with the Minister of Mines (and Mining Development Winston Chitando). He has a mandate from us to craft a new diamond policy which he is going to present next Tuesday in Cabinet," said President Mnangagwa. "Incorporated to that diamond policy is the view that the communities around where minerals of this nature – diamonds, platinum, lithium and so on -are found, must benefit. So that is going to come with legislation so that people around areas with minerals benefit." Former president Robert Mugabe was on record as saying there were a lot of leakages of diamonds in Chiadzwa, Marange, and estimated the prejudice at around $15 billion. 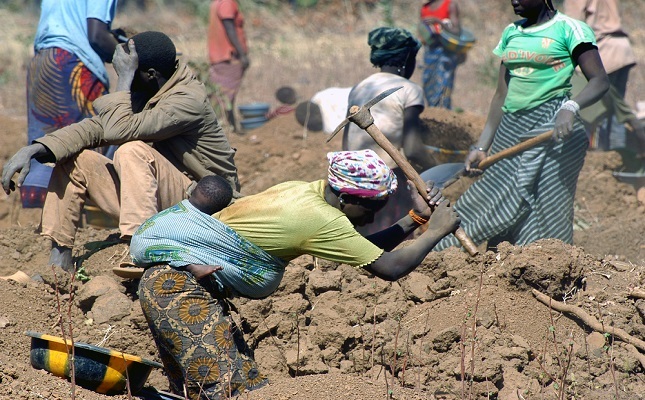 President Mnangagwa said Government was also crafting legislation to ensure people relocated to pave way for mineral exploitation were adequately compensated. "You are talking about compensation. Yes, indeed, in the legislation which we are crafting, this is also taken on board that as you move people from their traditional homes, they leave behind their graveyards, there is need to look into this issue and give them some compensation as we move them to new areas. "And also under the new administration we are taking on board social responsibility by any company or entity, so we put a clause of social responsibility," said President Mnangagwa. Turning to multiple farm-ownership, President Mnangagwa said the recently constituted Land Commission would conduct an audit on that vice as well as farm-sizes. "There are several issues they look at. Kune vanhu vakapiwa mapurazi, kuneaccusation yekuti mashefu. Vaipana mapurazi muzita rake, remudzimai, remuzukuru, ratete nasekuru, iwo ari ake. All that will be unearthed by the Land Commission. The second issue, we have sizes of farms. When you have a farm and the farm is larger than the required land size or farm size of that ecological region, there will be downsizing of farms. And in this process we are creating more land to be available for other people to be issued with land," said President Mnangagwa. He said Government would also look into allegations that women were sidelined in land allocation. The President, however, observed that the men who were getting land had wives. "Mataura kuti land inongopiwa varume vega, madzimai vashoma vanopiwa. Ini ndinofunga kuti vazhinji varume vanopiwa minda vane vakadzi vavo. Handifungi kuti kune varume tsvimborume dzakawanda dzakapiwa land. Asi kana kuine mudzimai anoda farming asina murume, ane equal right yekuwana allocation yeland, that is in our law," he said. On the Presidential Inputs Scheme, President Mnangagwa said Government would unveil a $487 million package that would cover 1,8 million families. "This time around we are giving $487 million for the Presidential Input Scheme and it is going to cover 1,8 million families, so there is not a single family in Zimbabwe that will not be covered by that scheme," he said.